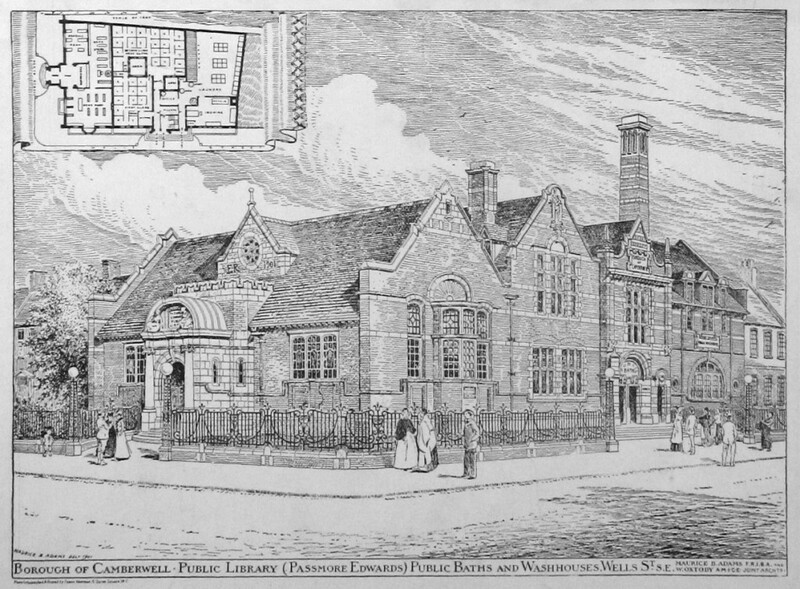 Passmore Edwards Library, Baths and Wash House, an early example of a ‘one-stop shop’, opened in 1903 on the corner of Wells Way and Neate Street. 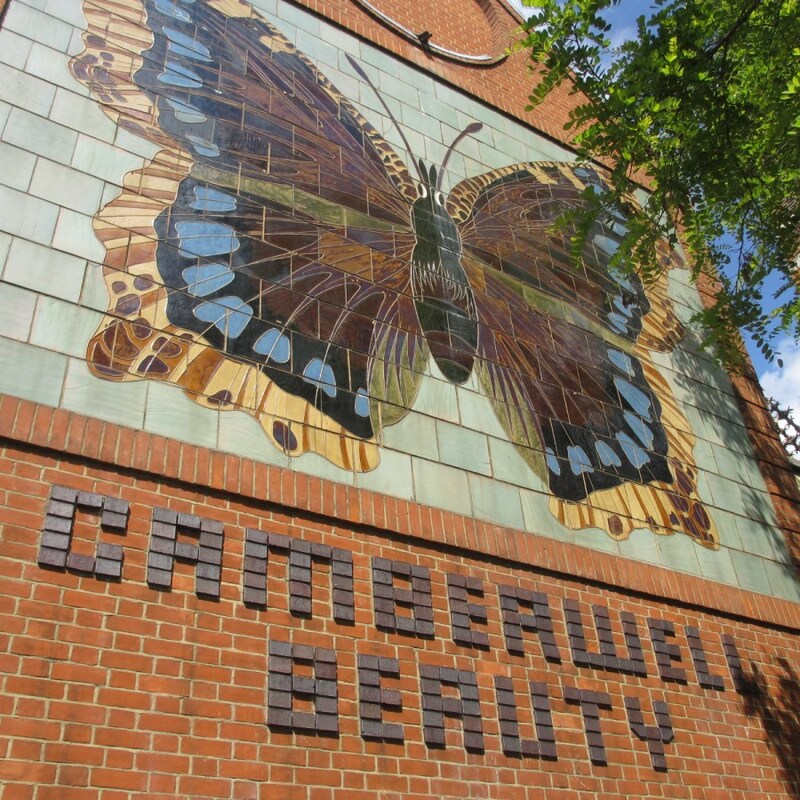 Partly funded by Victorian philanthropist John Passmore Edwards, its aim was to improve the health and leisure of local working people in a busy industrial and residential area, at a time when many houses lacked bathrooms, clothes-washing facilities and books. The ornate Grade II listed building was designed by Maurice Adams FRIBA and William Oxtoby AMICE, on land donated by the Rolls family (who later set up Rolls Royce), and opened in 1903. The great Victorian philanthropist John Passmore Edwards contributed £24,000 for the library. 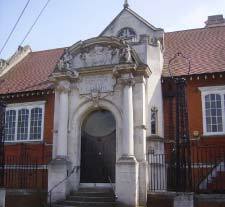 The Baths and Washhouse entrances are on Wells Way, and the Library entrance on Neate Street, which is now incorporated into Burgess Park. As you look up at the library entrance, two Ionic columns elaborately carved with capitals embellished with cherubs and dangling bunches of fruit flank the porch. Over each column the entablature (major elements of classical architecture and refering to the superstructure of mouldings and bands which lie horizontally above columns) breaks forward to support a kneeling figure flanking a tympanum (semi-circular or triangular decorative wall surface over an entrance, bounded by a lintel or arch) carved in high relief with standing putti supporting the coat-of-arms. The library consists of one large room, with a small basement for the childrens’ library. It was built together with other municipal facilities – a familiar concept at the time. The slipper baths comprised two larger communal baths and fifty slipper baths (bathtubs), separated into four departments (1st class/2nd class, hot/cold). A bracing 2nd class cold bath cost 1d, about 30p today. The public laundry offered thirty customers a washing trough, a steam drying horse, mangles and irons, plus a bonnet room! Sir Nikolaus Pevsner, well known scholar and author of the guides ‘The Buildings of England’, described the building, of red brick with Portland stone and Hopton Wood stone dressings, as being “a picturesque group with Baroque porch, Gothic gable, Tudor windows, and a Queen Anne bay-window, and yet quite successful and typical of 1900”. Other people have been known to refer to the red brick and white stone as “streaky bacon”! Inside the building, glazed brick is used extensively, with Brosely tiles for the roofs. Norwegian granite is utilised for the baths entrance. A number of notable craftsmen and engineers contributed to the building – Benham & Sons undertook the engineering work. The very fine wrought iron-work and fence, which are seperately Grade II listed, is by Coules & Sons of Blackfriars Rd, Art Metal Workers. The carvings, which include mermaids on the Baths entrance, are by local sculptors Gunthorpe & Horsman of Camberwell New Road, and leaded glass by Aldam, Heaton & Co – interior designers of the Titanic. The metal casement windows were supplied by Burt & Potts, the baths by Doulton & Co and the plumbing by George Jennings of Lambeth, who produced the first public flush toilets. The Jubilee Plaza (next to the baths) was laid out in 1977 with granite setts from nearby demolished factories. 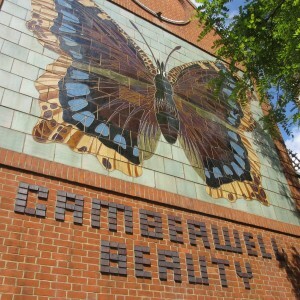 The Camberwell Beauty butterfly on the gable end of the building is the trademark of local stationers Samuel Jones & Co. The Royal Doulton tiles were moved here when the Southampton Way factory was demolished in 1982. Currently the building is in partial use. Lynn AC Boxing Club, Britain’s oldest continuing amateur Boxing Club, has been using the baths since 1981, and a church uses the upper floor. 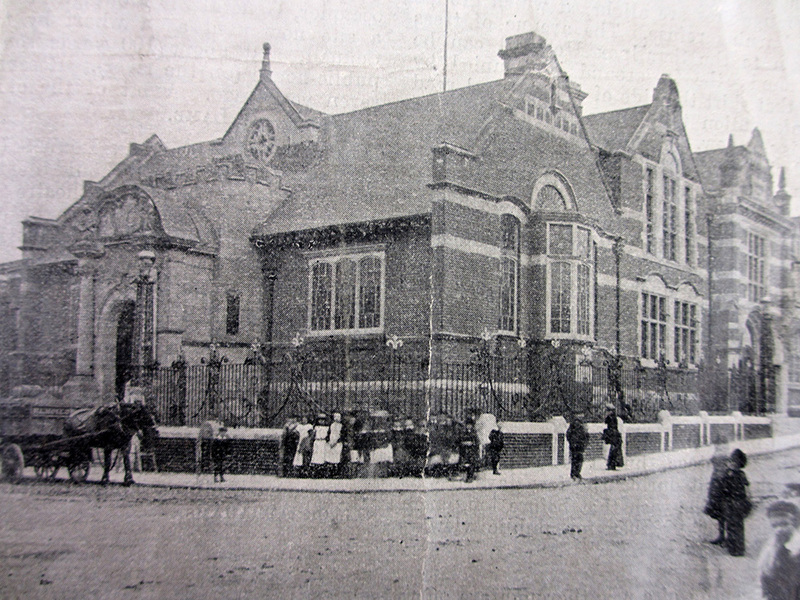 The main library building is currently vacant but, with the support of the Friends of Burgess Park, the building is now registered as a community asset. The Friends are actively hoping to encourage long-term uses for the building, and full incorporation into the infrastructure of the Park. I lived in Neate Street from 1940-59, I used the library when I was old enough. As a child I would go down stairs and the lady would help me choose my books. As I grew older I was allowed to go to parts of the upstairs library. Saturday mornings, once I was old enough, I would make my way down to the baths, usually meeting up with one or two friends on the way. We would pay our money to the cashier and get our soap etc. Once inside, we would wait in the lobby till our number was called, taking notes of the baths being allocated to adults who had tried to cheat us in some way. Shopkeepers at that time often swearing that children had given them a florin (10p) but the children knew it had been half a crown (12½p) – with the poverty in the area we knew exactly how much we had. Knowing which bath they were in, we exacted our small revenge by shouting for more hot or cold in their number once we ensconced in our own cubicle. Wow – a great memory. I’ve heard people complain about the indignity of having a cubicle with the taps on the outside, and having to call for more hot water, but you certainly used that to your advantage! I remember the baths and the library very well. The library was the first one I ever belonged to ( 1957 ) and most of the local people used the baths —- no bathrooms or even indooor toilets then! Happy days!! My mum and I would go to the baths once a week between 1960 and 1966. We would have a shared bath, the taps were on the outside of the cubical and you needed to call out “more hot in number 4 please.” We would also do the washing in the laundry. There you would have a cubical where there was a deep sink and a large washing drum that you used steam for large items. My mum would wash my school skirts and lay them on the top of the washing machine to dry whilst the bedding was being washed. You could use spinning machines and hot cupboards.